Thinking about getting those tomato plants purchased and planted? Be aware. New York’s State Agricultural Commissioner is alerting homeowners and commercial growers of the potential for late blight this growing season. While organic is the way most of us wish life could be, when it comes to dealing with a wet, cool spring, we must be vigilant about these types of diseases. http://www.empirestatenews.net/News/20110524-7.html You can check some past posts on late blight - what to do and what not to do. The priority for any homeowner grower is to be responsible for what you are planting as late blight is airborne, which means it can easily and rapidly spread. Plants must be protected in advance, which is one of the main reasons it can get ahead of people. By the time you see symptoms, it’s too late. 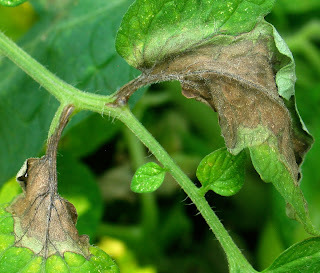 So for all those folks that think you plant tomatoes and your job is done, get up to speed on late blight disease. This Dutch proverb seems to wrap up this alert. “Sickness comes on horseback but departs on foot.” Stay vigilant on all the diseases that put on a saddle during our wet spring weather.